101 Tips to Make Your Home Show Like a Model! The first impression Buyers will have of your home is what it looks like from the outside. What are they going to say to themselves as they approach your home? Believe it or not, some Buyers will make a decision to keep driving just by looking at the outside of your home. Tidy up outside by removing leaves, branches or other debris to make a neat and tidy “drive up” appearance. Spruce up the lawn by cutting, trimming, weeding and fertilizing where necessary. A great looking lawn makes a fantastic first impression. Fresh mulch at the base of trees and in flowerbeds gives a well maintained look. Color things up by adding some bright annuals in blank places that could use some brightening. Add a colorful potted plant or pot of flowers at or near the front porch. Power wash the driveway, walkway, patio and deck. Make the garage and front doors look as inviting as you can. A fresh coat of paint and a new kick plate can transform a front door. A seasonal wreath can be very inviting. Be sure the garage door is not dented or dirty. Pick up and store garden equipment, buckets, rakes, shovels, lawn mowers and coil hoses neatly. Wipe down and refresh any play areas. Add fresh sand to a sand box and repair any rusted or dirty swings, slides and other outdoor play equipment. Clean the pool and keep it sparkling and free of pool toys, pool equipment and rafts. Wash outside of the house, if necessary and consider painting if the house needs it or the color is “dated”. A fresh coat of paint can make the house look completely updated. Look at the mailbox. Does it need freshening or replacing? Does the doorbell work? That’s a small sign of good maintenance and will keep you or someone else from being surprised by an unexpected showing. Make sure the house numbers make it easy to find. Consider replacing them if it would improve the look from the street. Cut back any vegetation that may have grown over the house numbers. Make the windows sparkle. Clean the windows, inside and out and re-caulk or paint trim where necessary. Does the porch light work? Look up and check for any cobwebs or wasp nests to knock down. It takes a minute for realtors to get keys out of the key box that will be on your front door. During this time, potential Buyers will be looking at the details on your front porch. Leave the porch light on. This will be very appreciated by realtors and Buyers coming to view your home after work or in the evening. A Buyer’s first moments in your home are the moments of greatest anticipation about what’s to come. It’s here in the entryway that you set the stage for their experience throughout the rest of your home. 19. Do you have a storm door? If so, is the glass clean and handle unlocked? 20. Is your front door easy to open? Repair any squeaky doors or sticky locks making it hard to enter the house. 21. Leave the Entry light on, in fact, we will talk more about lighting later, but check all light bulbs and brighten the Entry as much as possible. 22. 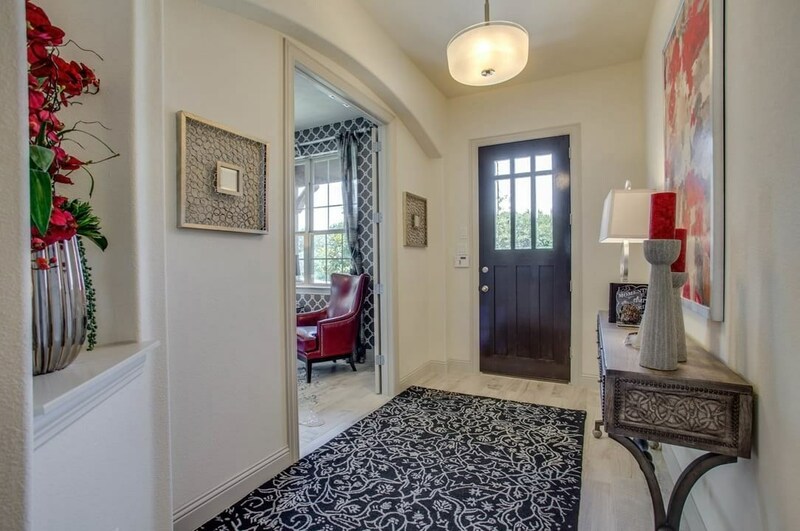 Make sure the entryway is free of clutter, shoes, coats and umbrellas and does not have a crowded hallway feeling. 23. If your entryway is small, brighten it up with a light colored coat of paint or a small entry table with a lamp on it. 24. Weed out all the “stuff” from the entry table. Pick up extra keys, mail and anything else that tends to pile up at the front door. 25. Clean out the coat closet or front closet of all but what is currently being used. If there are off season coats, boots, shoes, hats and scarves, pack them up. You are not likely to need them before you move and this will make the closet look spacious and uncluttered. 26. Give the whole house a real “once over” cleaning from top to bottom. Clean homes have a competitive edge and feel Loved! 27. Let some air in. Get a fresh breeze going to completely air out the house and get rid of any “stale” odors you may not even notice. Make it smell “springtime” fresh! 28. Start packing now. Pack up everything you don’t use right now. Pack boxes and store them out of the house, if possible, or neatly on one side of the garage. 29. Think model home. Remove “extra” furniture pieces and accessories. Make each room appear spacious, not crowded. Your favorite chair may have to go to storage temporarily. 30. Clean and deodorize carpets and rugs, paying special attention to high-traffic areas and stain removal. If a rug is worn out, consider replacing it now rather than later – you will still be able to take it with you to your new home. 31. Let’s get back to lighting! Check all the light fixtures and lamps, replace any burned out or low-light bulbs with bright white bulbs. Make sure light switches are functional, if not replace them. 32. If the couch, chairs or loveseat need some love, try a neutral slip cover and add a few accent pillows or throw blankets with pops of color. 33. If necessary, paint the walls. Paint is relatively inexpensive and a great return on investment. It doesn’t have to be white, but stay away from the too many walls in a dark color, that can make the house feel dark. Neutrals are usually best. 34. Remove any peeled or torn wallpaper and wallpaper borders. 35. Check the blinds and any window coverings to make sure they all work and move smoothly. Clean them all and keep them open to let in as much light as possible. 36. Remove all valuables and any weapons. Make sure confidential documents are out the sight or out of the house. 37. Weed out the clutter – check magazine racks and the coffee table, basically anywhere where things tend to pile up. Any magazines left out should be current. 38. Make sure the house smells it’s best at all times. Keep litter boxes clean at all times and preferably out of the house for showings. We love our pets, but some people have allergies. 39. Do some plant and flower triage, removing the ones that are not going to make it. Clean the leaves of the healthy ones and make sure they’ve been watered and are looking fresh. 40. Let the buyers see their lives in your home…not yours. Store excess family photos, the “wall of fame” and anything that is too much a reflection of your life. We want them to focus on what their life would be like in their new home. 41. Put the bookshelves on a diet. Pack up most of the books, leaving only larger ones and a few pretty details. Leave some extra space on bookshelves, overcrowding them can shrink the appearance of a room. The kitchen is the heart of the home and it’s most often the most important room to Buyers. 42. Cut down on visual clutter by removing items you normally store on the counter. 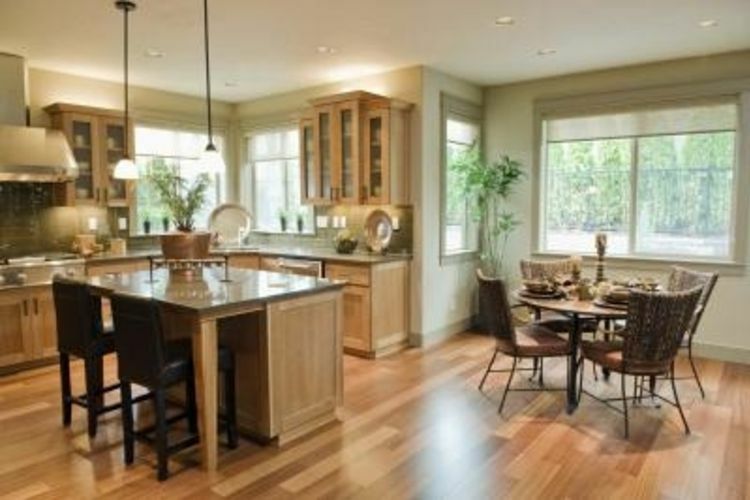 This will help your kitchen look more spacious and instantly add counter space. 43. If you have an “eat-in” kitchen, it should have a table and chairs in it. Buyers don’t often have the vision to see size and best use of rooms without furniture. 45. It’s a good idea to keep some ready to go, easy bake cookie dough on hand and bake up a few cookies just before a showing. Don’t over do it, but you might even leave a few out for guests. 46. Keep any exotic spices and fish to a minimum when cooking the night before a showing. Those scents tend to linger. 47. Thoroughly clean all your appliances and cup boards, inside and out. Buyers will often look in the oven, microwave or pantry to see how clean a house really is. 48. Make sure your cabinets and pantry are tidy and organized, too. Store non-essential items elsewhere to make the storage space feel large. 49. If you have a formal dining area, consider setting it to stimulate a Buyer’s imagination for hosting great dinner parties. 50. Clear as much as possible off the countertops. If you don’t use it every day, then it should go away while your home is on the market. You can bring it out when necessary, but make it easier on yourself for showing, by keeping those items stored. 51. Make sure the counters, bar and sinks are always spotless! 52. If you keep fruit or flowers on your counter, be sure they are always fresh. 53. If your cabinets show wear and tear, you might want to paint them or use a product called Liquid Gold to freshen them up. A simple trick to update the look of cabinet doors is to replace your current knobs with new ones. It’s much more affordable than new cabinets and can make quite a difference. 54. Shine your faucets and knobs and use spot remover to prevent water spots. 55. Remove notes, photos and calendars from the refrigerator door. 56. Empty your trash can daily and before every showing. Move all garbage and recycling bins so they are out of sight. The living room, family room, game room and media rooms are where your Buyers will do most of their “living”, so you want to make the space as inviting as possible. 57. If you have a favorite “old” chair that doesn’t go with the rest of the furniture, remove it. And note the size of your furniture, as large furniture can weigh down a space. 58. Add a rose bowl with flowers to the coffee table or a tray with a cute tea pot or scented candle, but please do not leave any candle burning when you leave the house for a showing! 59. Take down or rearrange pictures or objects that create the sense that this is your home. Patch and paint any holes as necessary. 60. Vacuum your floors each morning before showings. Remember agents can call for showings after you’ve left for work and may need to show your home before you return. 61. Clean the fireplace & stack fresh wood neatly inside. 62. If the flooring is not in good shape, clean or replace it. 63. If your furniture shows the effects of raising five kids or if pets have ruined the rugs and upholstery, think about storing or removing those pieces. Buy, borrow or rent what you need. 64. Put away holiday decorations unless you are showing the house during the holiday seasons. Even then, consider limiting your seasonal décor. 65. Move DVD collection, CDs and video games out of sight. 66. Open the drapes and blinds. Closed rooms with no natural light can feel depressing to Buyers. 67. Remove all knick-knacks under 10 inches tall. Next to the kitchen, the bathrooms in your home are the rooms that will get the most scrutiny. Some inexpensive designer tricks can make your bathroom look like a million bucks. 68. Always empty bathroom trash cans before showings. Put the trash can under the vanity if possible to clear floor space. We want the bathrooms to appear as large as possible. 69. A fresh new shower curtain is a great investment - very little cost for a big impact! 70. Things like toilet cleaners, plungers and hampers add clutter. Put them away while we are selling your home. 71. Keep all reading material out of sight in the bathrooms. 72. Place personal items (such as hair dryers, makeup and brushes) inside vanities or drawers. 73. Hang matching new towels. Get the best ones you can. Fluffy, fresh towels can add a luxurious feeling to any bathroom. 74. Remove everything from the countertop, except pretty soap sets, candles or fresh flowers. 75. Check the faucets for leaks or drips. Repair or replace faucets if they are leaky, dated or worn out. 76. New silicone beading can do wonders for your shower, tub and sink areas, especially if the caulk is stained or cracked. 77. Shine your faucets and knobs and use cleaner to prevent water spots. 78. Keep your shower and tub area spotless. Buyers will often look behind the shower curtain, so make sure the area looks as clean and organized. Keep soap and shampoo bottles to a minimum. 79. Scrub tiles and bleach the grout, if necessary, so that it sparkles. 80. Do you have a glass shower door? If it has residue on it, use CLR or similar product to clean it so it’s crystal clear and use a squidgy tool to remove water droplets after you shower. 81. Replace or paint the vanity cabinet if it shows excessive wear and tear. Replacing cabinet knobs in bathrooms can give an updated look to an older vanity, too. 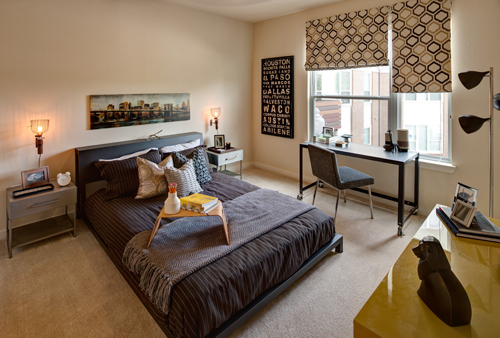 Bedrooms are a particularly important part of the home. Bigger is better. Buyers rarely, if ever, comment “This bedroom feels too large”, but they do often comment that bedrooms “feel too small”. Just like other rooms in the house, clutter takes up space and makes rooms look smaller. 82. Fresh flowers or a candle make excellent accessories on night stands. 83. New bed spreads or quilts make a bedroom feel inviting. 84. Always make your beds. Help them look pretty by making sure the coverings fit the beds properly and hang low enough to cover the view under the bed. Buyers don’t typically look under the beds, so you can store other non-essential items there (preferably in low storage boxes). 85. Put away stacks of reading material on night stands, leaving room for one good book. 86. Children’s personal items like posters, photos, drawings and awards are all items that should be taken down while showing the house. 87. Put away any and all items that hang off the backs of doors. When doors are used for storage, it looks like there is not enough closet space. 88. Buyers are most likely going to look in your closets, so a better place to “hide” things is under the bed. 89. Out of season or duplicate items that you don’t need should be taken out of the closet. Get an early start on packing, since you are planning to move. Pack these items and take to a rented storage unit or stack boxes neatly in the garage. 90. Remove all extra and empty hangers in closets and try to match the remaining hangers. This will make the closets feel neat and organized. 91. Coordinate clothing in closets by color or style and line shoes up neatly, up on a shelf, if possible and off the floor. Any items on the floor take up space. Even a full closet will feel larger when a Buyer can see the floor space. Working from home is a reality for many people today, so a functional home office space can give your home a competitive advantage over other homes on the market. Try to make the space as functional as possible and if it’s part of another room, make sure to maintain the main function of the room. 92. Store all files and paperwork you don’t need out for everyday work. 93. Remove big, bulky filing cabinets that take up a lot of space. Maybe move them to a closet. 94. Clean everything off the desk surface, leaving only a computer and desk lamp. A neat desktop makes the work space look more functional and the lighting makes it look more inviting. 95. Store all personal and confidential or client information out of sight. This includes any pricing or strategy details we have discussed about selling your home. Set up a password on your computer if you don’t already have one. 96. Weed out any posted items on bulletin boards or wall organizers. A few things are okay to make the office look functional, but an over crowded bulletin board will distract from the cleanliness of the room. Making the most of the utility space by brightening it up and making sure it’s clean and inviting is very important. 97. Clean and polish the washer and dryer to give them a bright shiny look. 98. Put all detergents, laundry items and ironing boards out of sight. Remove any residue on counters or in laundry sink. 99. 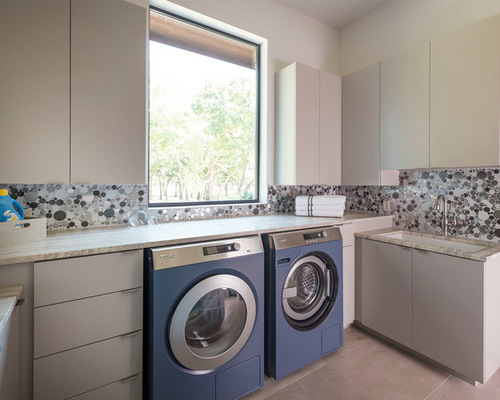 A bright throw rug in front of the washer and dryer will often help cheer up a utility space. 100. Tidy up and organize garage shelves and pick up as much as possible off the floors. Go ahead and discard, donate or recycle items that you don’t need to take with you when you move.